From the acclaimed author of Video Nights in Kathmandu comes this intriguing new book that deciphers the cultural ramifications of globalization and the rising tide of worldwide displacement. Beginning in Los Angeles International Airport, where town life?shops, services, sociability?is available without a town, Pico Iyer takes us on a tour of the transnational village our world has become. From Hong Kong, where people actually live in self-contained hotels, to Atlanta's Olympic Village, which seems to inadvertently commemorate a sort of corporate universalism, to Japan, where in the midst of alien surfaces his apartment building is called "The Memphis," Iyer ponders what the word "home" can possibly mean in a world whose face is blurred by its cultural fusion and its alarmingly rapid rate of change. From the acclaimed author of Video Nights in Kathmandu comes this intriguing new book that deciphers the cultural ramifications of globalization and the rising tide of worldwide displacement. Beginning in Los Angeles International Airport, where town life?shops, services, sociability?is available without a town, Pico Iyer takes us on a tour of the transnational village our world has become. 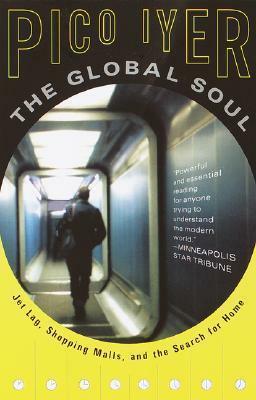 From Hong Kong, where people actually live in self-contained hotels, to Atlanta's Olympic Village, which seems to inadvertently commemorate a sort of corporate universalism, to Japan, where in the midst of alien surfaces his apartment building is called "The Memphis," Iyer ponders what the word "home" can possibly mean in a world whose face is blurred by its cultural fusion and its alarmingly rapid rate of change. Pico Iyer is the author of five previous books, including Video Night in Kathmandu and The Lady and the Monk. He lives in suburban Japan. From the Hardcover edition.